Home → Pay Per Click: What Is It? Pay Per Click: What Is It? Much of the rest of RankMagic.com focuses on SEO (search engine optimization). But Pay Per Click (PPC) is another website promotion tactic that can help your website to appear prominently in the search engines and you should understand what it is and when it’s appropriate. Pay Per Click or PPC advertising is called that because the most common form involves paying a certain fixed amount for every time someone clicks on your ad and goes to your web site as a result. THese ads are usually called “sponsored links” or “paid search listings”. Another version of sponsored links is available on a “pay per view” basis, where you pay a certain amount every time your ad is displayed to someone, whether they click through to your site or not. Both SEO and sponsored links can play effective parts in your search engine marketing (SEM) strategy. Often (but not always) SEO has a larger initial (up-front) cost because much of the effort to optimize your website happens before the results are actualized. On the other hand, results from this form of search engine marketing persist for a long time, potentially years, after that work has been completed. Sponsored ads generate traffic to your web site for only as long as you continue to pay for them. Stop paying for the clicks or views and your new visitors dry up. Sponsored links can give you a “quick fix”. And that may be just what your search engine marketing campaign needs. You may be able to start generating visitors in as little as 48 hours with pay per click services like Overture, Google, Ah-Ha and FindWhat, while results from SEO generally take a couple of months or more to materialize. While consumers find paid results acceptable for finding certain kinds of information, it fails to provide the best and most comprehensive results for many queries. Consumers continue to perceive sponsored results as commercial advertisements, clicking on the main search results a greater percentage of the time. This happens even though the sponsored results appear first. It’s not only the perception that these results are basically commercial advertisements, but also the fact that they are not as targeted as crawler-based results. Crawler-based results try to serve up the best matches to a query regardless of how much money the vendor may be willing to spend. 85% of the audience thinks they click on sponsored links less than 40% of all their searches. In most cases members of the business community rely on organic search results, not using paid search listings. Paid listings do not always yield the most relevant results – 78% of all respondents feel that they find the information that they are looking for less than 40% of the time through sponsored links. 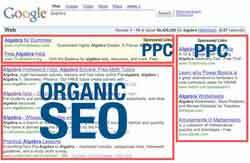 A 2009 study at NYU showed that if your business has both a paid result and an organic result appear at the same time, you have a better chance of your paid result getting clicked than if the organic result had not appeared. Presumably, the reverse is also true: that your PPC listing increases the odds of your organic listing being clicked. If you’re considering using an organic search engine optimization service, Rank Magic is the place to start. Contact Rank Magic today!